An easy strategy clock maker that helps make strategy clock and charts with free templates. Quickly and easily create strategy clock such as bowman's strategy clock. Discover why Edraw is an awesome strategy clock maker: Download it Now. Bowman's Strategy Clock is a model used in marketing to analyze the competitiveness of an organization compared to other competitors. It was developed by Cliff Bowman and David Faulkner as a detail illustration of the 3 Porter generic strategies. Bowman's Strategy Clock presents 8 possible strategies in 4 quadrants defined by the axes of price and perceived added value. The resulting star shape is reminiscent of a clock face, giving this tool its name. This visualization tool allows businesses to further investigate exactly what each company offers while choosing the best way to stay ahead of others. 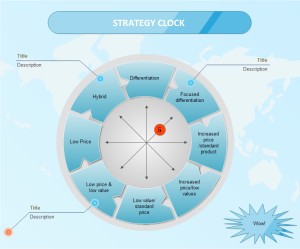 Edraw Strategy Clock maker helps create very useful framework for thinking through the options you have in the customer value map and how competitors operate. For those already accustomed with other Microsoft apps such as Word or Excel, the interface will be very familiar. Simply drag and drop symbols, apply built-in designed themes, and share your finished strategy clock into a presentation or PDF with one click automatically. 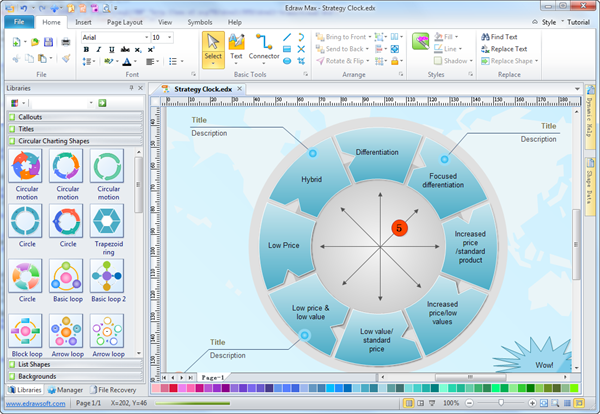 Uses full color, vector, predefined shapes for instant Strategy Clock creation. Export drawing as WMF, PDF to import into CAD or MS programs. Prints any size drawing with any desired scale. Ability to create user-defined custom shapes. Provides dynamic zooming & panning capabilities. Allows all types of borders, notes & title blocks. Give this strategy clock example a shot. You will surely appreciate how well it works.